CLEARWATER, FL – The Pinellas Community Foundation (PCF) and the Area Agency on Aging of Pasco-Pinellas (AAAPP) are joining forces to conduct a comprehensive needs assessment of the area’s aging community. Nearly 30 percent of residents in Pinellas and Pasco counties are over 60 years old. The goal of the assessment is to gather direct feedback from residents aged 60 and over to identify unmet needs. 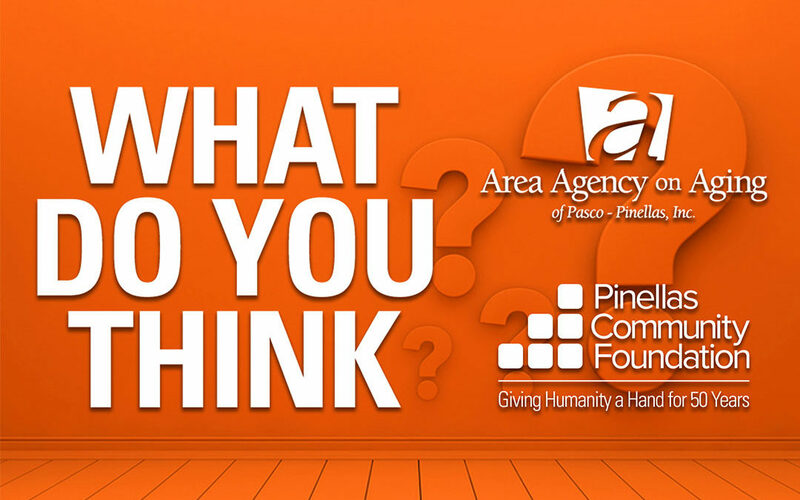 “We’ll be seeking feedback about overall community quality, current services in the community, participation in activities, health and wellness, design and land use, and disaster preparedness,” said Ann Marie Winter, Executive Director, Area Agency on Aging of Pasco-Pinellas. Results of CASOA will be available in July 2019, providing direct resident feedback that can be incorporated into the work plans of government, foundations, AAAPP, nonprofits serving the aging population, and others. In January 2018, Pinellas Community Foundation (PCF) convened a group of over 15 community organizations and experts in the field of aging to identify the needs of senior residents. Out of those meetings grew consensus to conduct a comprehensive needs assessment of our aging community. The CASOA is an outcome of this work and the survey has been included in AAAPP’s strategic plan to identify and begin to address the unmet needs of seniors and their caregivers with services that are not already funded by the federal and state governments. The CASOA steering committee has involvement from the following: Area Agency on Aging of Pasco-Pinellas, the cities of Clearwater, Dade City, New Port Richey and St. Petersburg, Pasco County Government, Pasco County Health Department, Pinellas Community Foundation, Pinellas County Health Department and Pinellas County Human Services. (PCF) was founded in 1969. With over $100 million in charitable assets, PCF seeks effective solutions for Pinellas County’s most challenging social, environmental and educational issues, while supporting the advancement of arts and culture. PCF is the only charitable foundation providing donors with customizable giving opportunities to enhance the quality of life for Pinellas County residents. More than 262 charitable organizations have received $55 million in donor-funded grants to support their community programs. PCF’s mission is made possible thanks to the generosity of donors. For information, call 727-531-0058. (AAAPP) is a non-profit organization that has been serving seniors and individuals with disabilities in our community since 1974. AAAPP serves as the Aging and Disability Resource Center for the entire two-county area, providing an initial entry point for all aging and disability social services and coordinating a network of partners and providers to better meet the needs of our aging population. For more information, call 727-570-9696 or visit http://agingcarefl.org/.